A special Happy Birthday to my little brother Geoff today. Hope your day is extra special . A Happy Birthday card today with a Cuttlebug embossed background, paper doily and a felt doily behind the Hearty Crafts cupcake topper. Finished with a flower. I have used a Creatables die and Graphic 45 paper to background this Hearty Crafts 3D topper as well as a Sticker Store greeting. I have some new Hearty Crafts 3D images to show you this week. Two cute baby cards today using the new 3d toppers and Spellbinders dies. I have been enjoying playing with the Prima/Julie Nutting Doll Stamps For this canvas I ripped paper and inked the edges to make a mosaic type of background then added a piece of lace and a pearl and rhinestone flourish. Today I would like to share a tissue box cover that I made as a Christmas gift I embossed the blue panels with a Couture Creations folder and added a flourish and butterflies to the sides , a touch of lace and some flowers finish off the top. A Baby bottle gift box which I filled with tiny little socks. I also made some bedding for the inside of the pram. Today I would like to share a couple of note books I altered for Christmas gifts. I decorated the first one with Graphic 45 Botanical tag and papers from my stash. The second note book was for my daughter and I decorated it with items from my stash. This will be my last Christmas decoration for the season ( promise) I made these baubles some time back from kits. 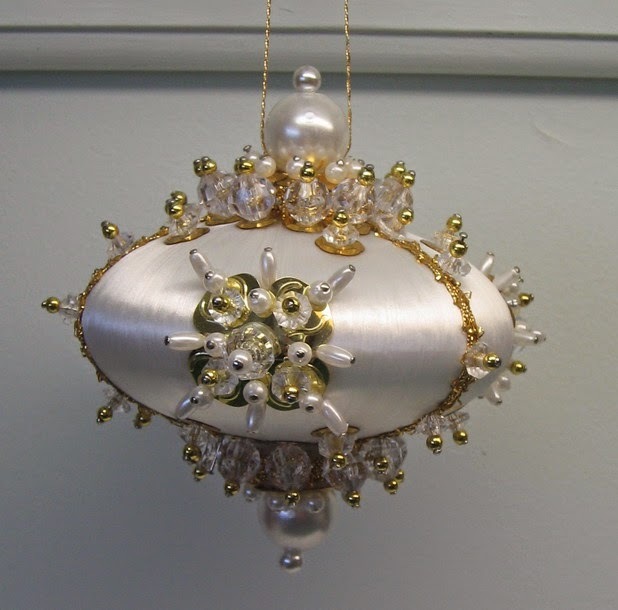 The base is a Styrofoam ball and the beads are attached with pins, fairly painstaking and time consuming but a lovely finished decoration. Our December Card Swap over at Craft Mad was to make Christmas themed cards two cards for your partner. My first card is a box card cut on the Klik n Kut Zing and I have used glitter card from DCWV.